The plugin for the mobile theme works well, but I can’t set the option for desktop version to work on a mobile. The search plugin gives search results with most recent first, which is good – but doesn’t work with the mobile theme. Looks like I need to investigate further! This entry was posted in Uncategorized on July 8, 2018 by Sharpo. Waiting to depart on the 2.25 from Kidderminster. This entry was posted in All recent postings, Severn Valley Railway, Sharpo's World Photo Updates, Uncategorized on June 6, 2018 by Sharpo. Fortunately, this event is already in the gallery, so an easy task to add a few photos for this posting. In total there are 199 photos already uploaded. I’m sure you all know more about the vehicles than I do! This entry was posted in Uncategorized on June 2, 2018 by Sharpo. On the first day of the Gala at Kidderminster I was standing for about 7 hours as I filmed the trains, so on this day I wanted something more relaxing. With a couple of folding chairs, Andrew and I had an easy day as the trains rolled past, filming from about 10am through to some time after 4pm when the late running 15.49 off Kidderminster with 73136 passed. Heading back to the car we just managed to catch a glimpse of 56078 to finish off our day. There are two videos to cover the day, the first has 50031, 66726, 88010, D832, 55019, D9551, 50049, 33108, D1015 and 47712. The second has 37688, D9551, 47712, 50031, D821, 50049, 55019, 56078, 50035, 33108 and 73136. Oh well, just day 3 to do now, I didn’t bother with the mixed traction day, went for some miniatures instead. This entry was posted in All recent postings, Severn Valley Railway, Sharpo's World video updates, Uncategorized on May 23, 2018 by Sharpo. E6005 and The Lady Armaghdale at Bewdley in 2004, 45110 at Arley in 2008, 47580, 37264, 45133, 31271 and 50135 at Kidderminster in 2010, 37516 and 37503 at Old Hill in 2011, D8059 and 47739 at Old Hill in 2013 and 57307, 57306 and 88003 at Kidderminster in 2017. This entry was posted in "On This Day" (in the past), All recent postings, Uncategorized on May 18, 2018 by Sharpo. Browsing through my photos for the “on this day” post, I’ve just come across the first steam rally photos for any of the years. I was only at the rally for a couple of hours, having watched a lot of Land Rovers on a run from Solihull to Gaydon earlier in the day. I took over 400 photos, not great quality, but I’ve chosen 12 for a bit of variety from the day. My knowledge of road vehicles is minimal, which explains lack of descriptions! This entry was posted in Steam Rallies (old), Uncategorized on May 4, 2018 by Sharpo. 2003 and my first digital camera, so poor quality, 56067 at Hillam Crossing, near Monk Fryston. Then 3 x 47s – 47355, 47712 & 47703 at Derby in 2004. Finally 46443 at Bewdley in 2010. This entry was posted in "On This Day" (in the past), Uncategorized on February 7, 2018 by Sharpo. I soon forget the photos and numbers of locos that are showing in this category, so I am trying a “table” which lists the numbers, location etc. of each photo. The columns can be sorted to make it easier to find the details. All very experimental at the moment but I’ve started with diesel & electric traction. Steam will be in a seperate table to follow later. You can view the table from the link below…. This entry was posted in "On This Day" (in the past), Uncategorized on February 5, 2018 by Sharpo. The first photo is at the SVR showing 45110 near the site of Rifle Range Halt in 2007. Then in 2009 66301 at Northfield. Finally a video of 70019 at Nuneaton, did I get bowled – watch the video! This entry was posted in Uncategorized on February 4, 2018 by Sharpo. Final video and photos from Arley, and it was getting darker. This entry was posted in All recent postings, Sharpo's World gallery, Sharpo's World Photo Updates, Uncategorized on January 4, 2018 by Sharpo. A few hours at Arley to film the Santa trains arriving and departing. 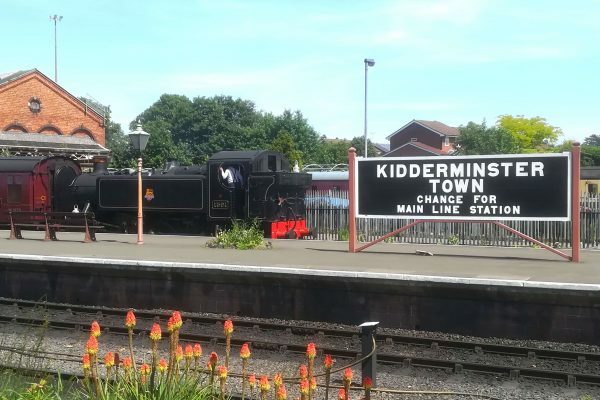 The procedure is – train arrives, loco runs round to rear of train when southbound platform is clear and when stock is empty it is shunted towards Highley and then back into the other platform to form the next departure to Kidderminster. A lot of photos from above video, so split into two pages. This entry was posted in All recent postings, Sharpo's World Photo Updates, Sharpo's World video updates, Uncategorized on January 4, 2018 by Sharpo. It’s almost expected, a train comes down as your filming one climbing the bank. At least it wasn’t a stopping train, and I’ve seen the Tesco many times before so don’t really need to worry about it. This entry was posted in Sharpo's World Photo Updates, Sharpo's World video updates, Uncategorized on August 7, 2017 by Sharpo.